Sections of railway that connect railway lines, as well as stations and platforms all are considered railway items. Railroad lines only use one line (so you should draw one line). For the exceptions, see 3.12.1.1.7. Sections of railway must be drawn in accordance with 2.6.1.1.1. General rules for drawing linear items. Draw all railway lines that connect stations, crossing loops, stops, block posts, and train yards, regardless of if they are related to passenger travel, what their technical condition is, or what their form of ownership is. You can draw railway fragments that were decommissioned, even if they are of an insignificant size. You should not include them among the parts of a “ Railway line ”, though. Draw them as “Sections of railway line” that are not connected to the broader Railway line. with the exception of situations described below (in point 3.12.1.1.5.1. Sections of railway run alongside roadways of general use (class 1-7, see section 3.3.2.1. Class) that are at least 0.5 km in length. Sections of railway intersect with roadways of general use (class 1-7 see section 3.3.2.1. Class) in the form of crossings, viaducts, and overpasses. In this case, the railway line will include the sections of railway going all the way up to the last intersection with the general access roadway. 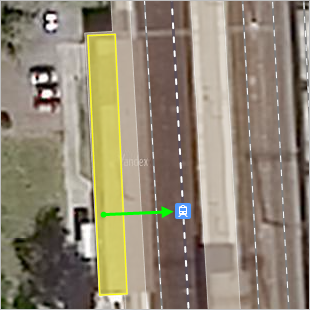 If the transit tracks bend around a freight station from different sides and are 100 m or more apart from each other. If that is the case, the railway line should include all railway sections up to their nearest junctions on the train stations. Do not draw railway sections that don't actually exist as a way to connect the tracks earlier than they are supposed to. “Railway road” items on the map must comprise an interconnected network, just like their real-life counterparts. Compound “Railway road” items that represent access routes may also include nearby railroad sections which connect the main part of the item with the larger network via the shortest route. Draw all lines that link points and interchanges in a railway system. Narrow-gauge railroads (including children's railroads) are displayed according to the same rules as other railroads, with the exception of the network connectivity rule (see section 3.12.1.1.8). 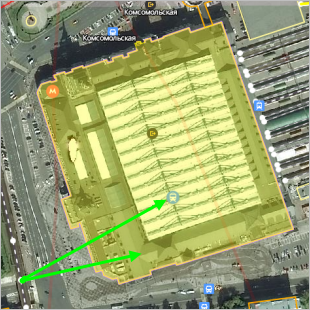 If the station building is located at some distance from the passenger platform and is only involved in operations involving cargo or technical assignments (for example: Perovo, Vakhitovo), then don't plot it on the map. If none of these structures are present, put the placemark at the place where passengers exit onto the platform (i.e. where the pedestrian bridge, underpass, or pedestrian deck is located. Note. This rule should also be used in cases where the passenger platforms of oncoming lines are spaced apart along the railway line relative to each other (for example: Perlovskaay, Kutuzovskaya). If there are no such platforms, then put the placemark at the center of the passenger platforms. If there are no platforms at all, then put it at the control post. If there is no control post — at the center of the station territory. If they are located along separate railway tracks that belong to the same line and are located 100 m or more apart from each other. situated on the transit ways, the envelopes from different sides of the large marshalling yards (for example: Yudino, Lyangasovo Pass. O. p. Central checkpoint stations Orekhovo-Zuyevo). When plotting placemarks for railways or stations, make sure that they don't overlap with address points. If a closed station was torn down, do not draw it. This category of map items includes platforms for the following types of transit: railways (those platforms that rise above ground level), metro stations, rapid trams, and other rapid transit. You can draw platforms that are in use, as well as those that are decommissioned (the main thing is to map any existing platforms). Don't draw platforms that are located completely under a roof or underground (such as underground metro stations or train stations where the platforms are located inside the building).